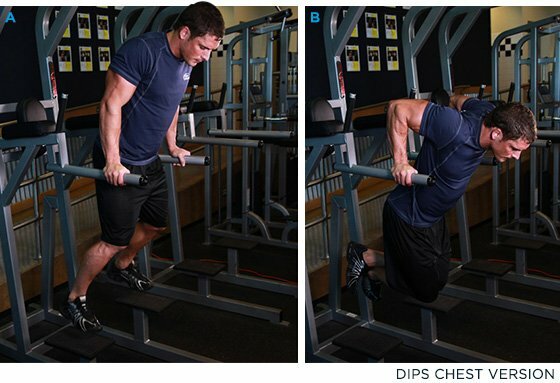 Whether you're working toward a muscle-up or just looking to mix up your upper-body training, dips have a lot to offer. If you've been avoiding them just because they're hard, it's time to get back on the bar! Not every exercise earns distinction as a member of the royal family of mass building. You've probably heard of squats (or deadlifts) referred to as the king of lower-body exercises. Well it's time to get acquainted with the king of upper-body mass builders: the dip. I realize there are some who may dispute the dip's claim to the throne, saying instead that the bench press or pull-up is king. Disputes over the throne are a historical inevitability, and this is not the place to settle such battles! At least we can all agree that dips are worthy of the title of Archduke. Like archdukes in general, the dip seems to have fallen by the wayside over the years. Like many other old-school, simple-yet-brutally-effective exercises, it has been labeled as dangerous and has suffered slanderous injuries to its reputation. Well, it's high time that the dip is vindicated! Your chest and triceps deserve that much. OK, I'll admit it. There are people who just probably shouldn't do dips. Not every exercise is good for everybody. This is a basic rule of strength training, and it's one that you may ignore at your own peril. If you have a history of shoulder injuries, particularly injuries involving the AC joint, you're probably better off just leaving dips out of your program. The movement puts the shoulder joint in a less-than-optimal position and could make your problem worse. However, if you absolutely insist on doing dips anyway, try restricting the range of motion to one that is comfortable and painless. You can also experiment with these different versions of the exercise to see which feels best. Bench dips are a great place to start if you don't have the strength yet to do a parallel bar dip. If you're totally new to strength training, you may need to start off with your feet on the floor and your hands on the bench behind you. If you've got a good level of strength, you can elevate your feet on another bench to make the movement more difficult. Increase the difficulty further by placing some weight on your lap. The bench dip places more emphasis on the triceps and shoulders than other versions of the movement. Given how common shoulder pain and impingement are among weightlifters, this has no doubt helped to build its "dangerous" reputation. The bench dip can still have a place in a balanced program, though. Even for an advanced trainee, it is great way to burn out your triceps at the end of your workout. This is the dip in all its glory. One of the best exercises you can perform to build the chest, triceps and shoulders, parallel bar dips train these muscles in a completely different angle and range of motion than push-ups and bench pressing. Unlike the push-up, parallel bar dips provide no support, so you are forced to lift your entire bodyweight. You can also easily add resistance by attaching weight to a dip belt. Another great thing about parallel bar dips is that you can directly influence which muscles do the most work by changing your body position. Lean forward to activate the muscles in the chest more. Keep your torso vertical to make the triceps do more work. Not ready for bodyweight parallel bar dips? No problem. Either stick to weighted versions of the bench dip to build strength, or attach a resistance band to the bars. Hook one end to each bar so it hangs down in the middle and step on the band or put your knees in it. It will provide assistance at the bottom of the movement, but then helps less as you reach the top. The straight bar dip is a variation you probably won't often see. It's a step above the parallel bar dip in difficulty and is essential to practice if you ever want to be able to do a muscle-up. To do it, place both hands on a bar in front of you and lower yourself down just like a regular dip. The main difference here is that both hands are on a single bar in front of the body as opposed to at your side in the parallel bar dip. This means that unlike other dip variations, you can adjust the width of your grip on the bar. Keeping your grip narrow focuses resistance on the triceps; going a bit wider grip emphasizes the chest. Ring dips are a whole other animal when compared to bar dips. They require much more stability to perform. As such, they are one of the harder variations you can do. Keeping your arms close to your body is essential to being successful at this movement. If you let your hands drift out, you'll lose your stability and leverage and increase your risk of injury. There's no law that says you have to add weight to a dip. After all, you can always perform high-rep bodyweight dips to build endurance or get a pump. However, if you decide to get serious about dips, experimenting with adding weight will probably be a good idea at some point. A simple guideline is that once you can perform 12-15 non-weighted reps with good form, it's time to grab the belt. Just don't be the guy who is so anxious to add weight that your ego gets in the way and you go from executing great reps to barely knocking out a few crappy ones. Control is essential to safely doing dips. Don't forget it! Dips are an excellent addition, but they probably shouldn't serve as your primary pressing exercise when you train. That honor still goes to movements like bench and overhead presses, in my opinion. However, dip variations make an excellent addition as assistance work, and they might be just what you need to take your triceps development to the next level. Since dips are a compound exercise, another great use for them is as your first exercise in an arms workout. 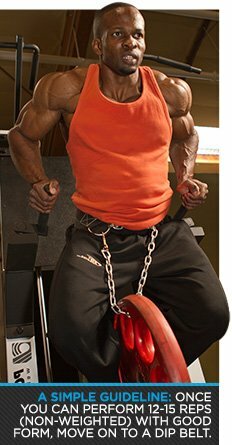 This is an excellent time to use weighted dips when you're ready.